Motorists who drive too close to cyclists as they overtake are being targeted by police officers on bikes. Officers in the West Midlands will radio details of "close-pass drivers" for patrol car colleagues to intercept. 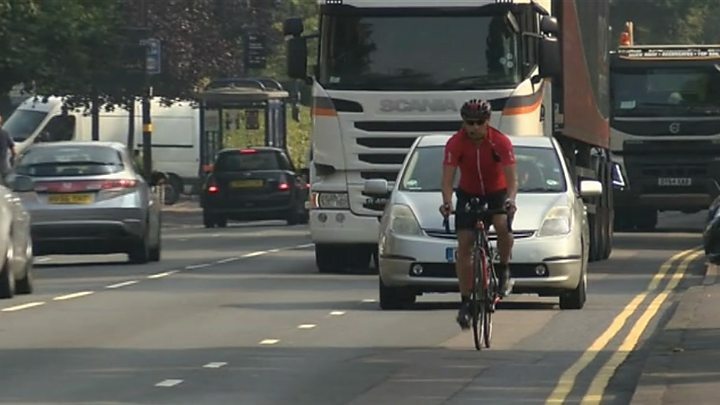 Cyclists should be given at least the same space as vehicles, widely considered to be 1.5m (4.9ft), and offending drivers risk prosecution, the force said. Drivers stopped will initially be offered warnings at the roadside. But repeat offenders, or anyone deemed to have driven "dangerously close," could expect to be prosecuted for driving without due care and attention, the force said. The force is carrying out an operation on some of the region's busiest routes, including Hagley Road, Pershore Road and Bristol Road, in Birmingham. Traffic officer PC Mark Hodson, said: "Cyclists may suddenly need to avoid uneven road surfaces or obstacles like drain covers so it's important to afford them plenty of room." David Cox, chair of trustees at cycling charity Cycling UK, said the problem "may be due to ignorance of the Highway Code and carelessness but sometimes it is done deliberately and aggressively". Royal Society for the Prevention of Accidents (RoSPA) road safety manager Nick Lloyd said: "Ideally cyclists would not need to mingle with traffic on the roads, and a lot is being invested in road infrastructure to make this a reality." But he said "until this happens we need to make sure we are educating".